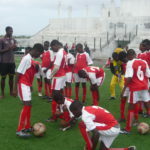 The past sunday was once more a day with football games for the age groups U10, U12, U14 and U16 of our football school. They played against the neighbouring village Chão Bom. The games were all won by our young players. You can imagine their proudness! The two trainers Patas and Nene are organising games for the kids regularly. The project management says ‘at least once a month’. But the trainers beat this presetting most of the time. Not because of pressure from the project management but because of the pressure of 140 children and adolescentes of the football school. If there are no adversaries they arrange games among the agegroups. This entry was posted in Uncategorized, What we do and tagged football games, football school, freetime, U10, U12, U14, U16. Bookmark the permalink.